In Virginia, not too far from where I grew up, there is this great gem of a Chinese restaurant that has been a favorite in town for ages. The Peking Gourmet Inn is the definition of old school – red leather banquettes, rich mahogany and waiters and waitresses in tuxes, carving paper-thin slices of peking duck tableside. The restaurant is beloved by just about every US President and dignitary that you could possibly imagine, and the walls of the place are adorned with photos of each and every one of them. It’s a real treat to go there, but unfortunately, just about everyone in the DC Metro area feels the same way. I often find myself jonesing for their Garlic Shoots, the mildly-flavored, inner sprout of the garlic clove specially grown on their farm and then sauteed with the protein of your choice. Or the Stuffed Eggplant with Springtime Vegetables – only served there around Chinese New Year and so very addictive with its savory shrimp filling and tender japanese eggplant flash-fried and served in a delicate sauce. But its when these incredibly seasonal dishes are sold out or not on the menu that I turn to my tried and true – Pork with Bamboo Shoots. 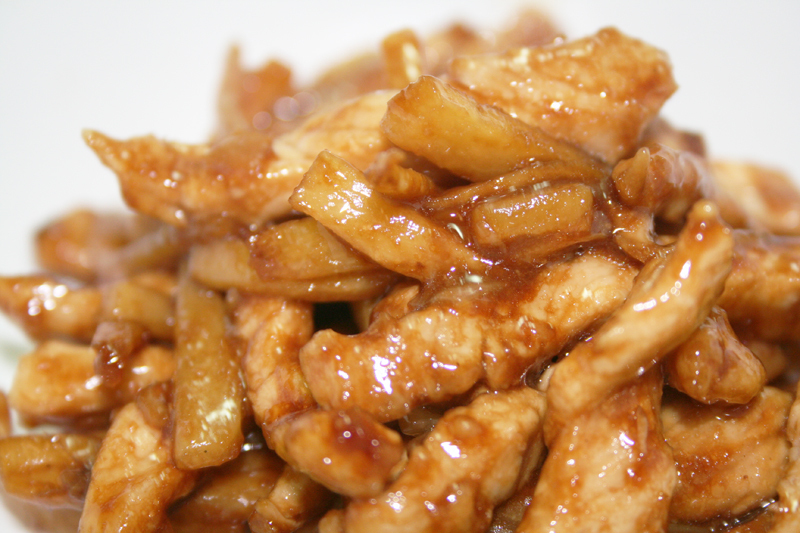 The Peking Gourmet Inn knows the joys of simplicity – thin strips of pork and bamboo shoots comprise this dish, all within a ginger-enriched sauce and nothing else. There’s something to be said about not mucking with success and letting individual ingredients shine. When I don’t feel like a 2 hour wait, or I’m not in town, I turn to this even more simplified version of their dish. It’s not an exact replica, but so close in flavor profile that my cravings subside. I even serve it with another rip from Peking Gourmet Inn – their Un-Fried Rice with Eggs and Peas. A couple of bites in and I feel like I’m at home. Slice the scallions into 2 in. long pieces and then julienne into matchsticks. You should have thin slivers of scallion. Drain the bamboo shoots and slice them lengthwise into matchsticks as well. Slice the ginger into very, very thin matchsticks. Set all three aside. Starting with the pork – I like to use eye round chops or thin loin chops because they are lean and easy to slice well. Trim pork of all visible fat. If the chops are more than a 1/4 in. thick, halve them so that they are thinner. Slice into narrow strips and place into a mixing bowl. Add the sugar, sherry, corn starch, white pepper, salt and soy. Mix thoroughly and set aside to marinate for 10-15 minutes. In a wok or large pan, heat vegetable oil over very high heat until shimmering. Add garlic and stir until fragrant, about 30 seconds. Add pork and stir vigorously until almost cooked through. Add scallions and oyster sauce and stir to combine until pork is completely cooked through. Turn off heat and drizzle with sesame oil. Serve with rice.